Last October, Inhabitat was in Buenos Aires just in time for CASA FOA, an event featuring designs that raise funds towards ophthalmology research. The 2014 event is coming up soon on October 10th, so we thought we'd took a look back at some of the best designs from last year's show. 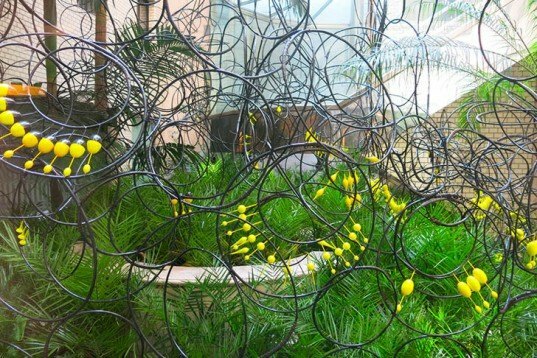 Created by Mercedes Malbrán de Campos and a group of ladies back in 1983, this annual event transforms a grand unused building within the Argentine capital into a hub for design enthusiasts. Alejandro Bustillo's stunning Tornquist Bank was chosen to host the 2013 edition. We scoured the halls, scoping out the greenest and most delightful spaces and objects on show. Hit the jump to see the best of the best! Last year’s CASA FOA was set at the old Tornquist Bank; a 1926 Neoclassical National Monument right in right Buenos Aires‘ city center. Architect Julio Oropel‘s Wine Bar Trapiche welcomed visitors with an intimate dark cafeteria decorated with growing mushrooms and MDF and melamine furniture that has antimicrobial certification. Looking out from the Wine Bar, José Luis Zacarías Otiñano‘s Pensalis Pop… Jardín Aéreo exposed geometrical sculptures from mimbre with bright fishing buoys among 800 baby palm trees. Within CASA FOA’s 43,000 square feet decorated area, a space by Grupo 7 was created from repurposed pallets and lighted by rows of LED lights. 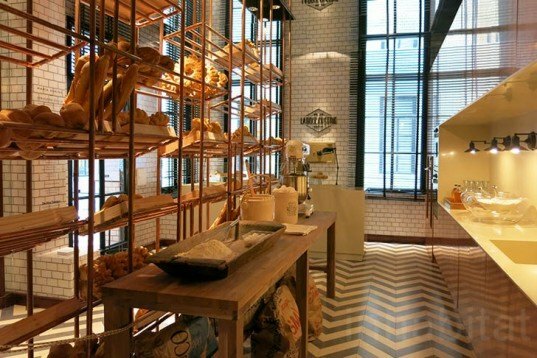 Architects Zunino+ Grillo‘s delicious bakery space La Boulangerie featured old bread tools, plenty of natural materials and a gorgeous standard copper pipe exhibitor incorporating the old bank’s safety box on their design. 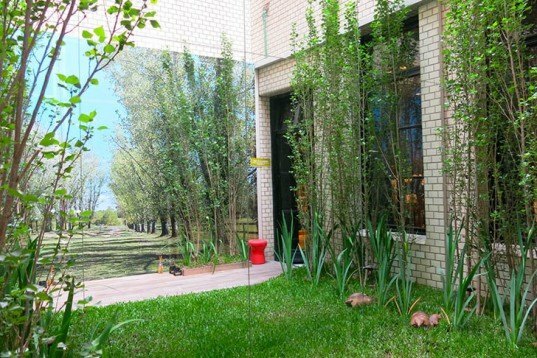 The landscaping Gold Medal was for Matilde Oyharzabal and Florencia Valloud who created a clever Terraza Verde en Realidad Virtual (Virtual Reality Green Terrace) using a whole-wall mirror to create a sense of more space. 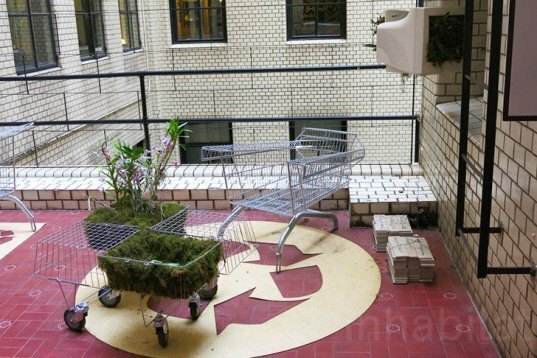 Cristina Le Mehauté created outdoor furniture from shopping trolleys for her Consumo Cuidado (Responsible Consumption) balcony area. Industrial designers Patricio Barry and Cristian Izuneta’s curvy Banco Rubén bench was designed for public spaces, and constructed from a steel structure and a strong metal curtain. 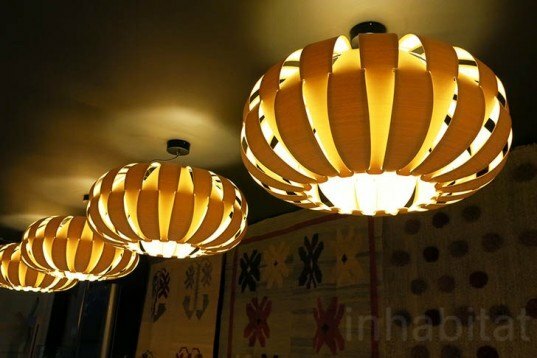 WepLight unveiled a gorgeous collection of flat-pack hanging lights made from flexible wood veneer that gives off a soft warm shine. The sweet wooden toys and mobiles by Fabrikken were also on show at last year’s CASA FOA, combining a clean Nordic aesthetic with local icons like Tango and the fantastic Buenos Aires Planetarium. 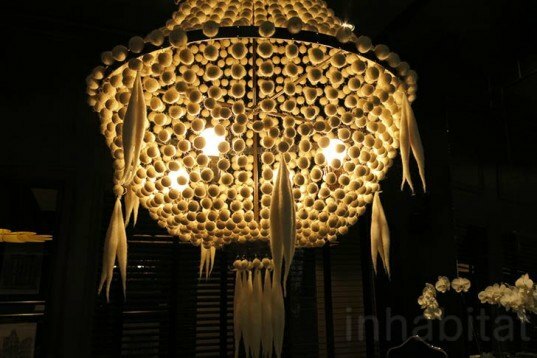 Architects Francisco Marconi and Guadalupe Diez created a luxurious bathroom space featuring a unique chandelier constructed from natural handcrafted felt. 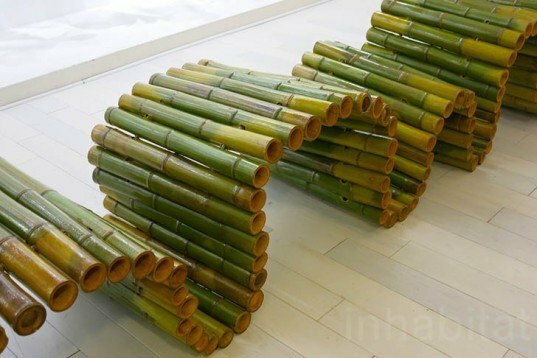 Eco-designer Agustin Albarracin creates wonders from local fast growing Tacuara cane, including this undulating Banco Verde II (Green Bench) for people to share and perch upon. 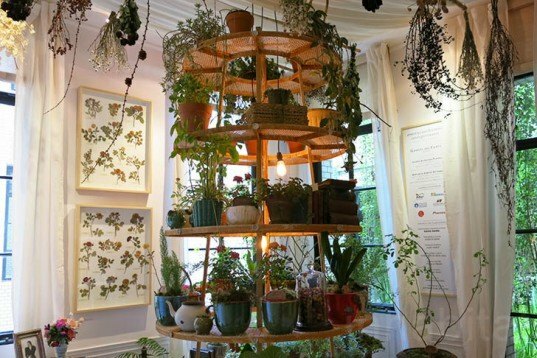 And last but not least was a delightful feminine space by Ernestina Anchorena and Carola Pirovano, which was decorated as a blooming winter garden for enjoying nature and reading poems. 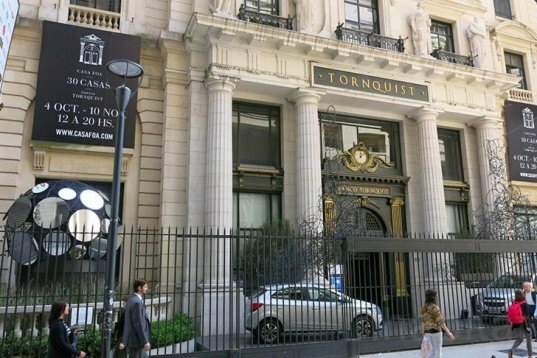 This year's CASA FOA was set at the old Tornquist Bank, a 1926 Neoclassical National Monument right in right Buenos Aires' city center. 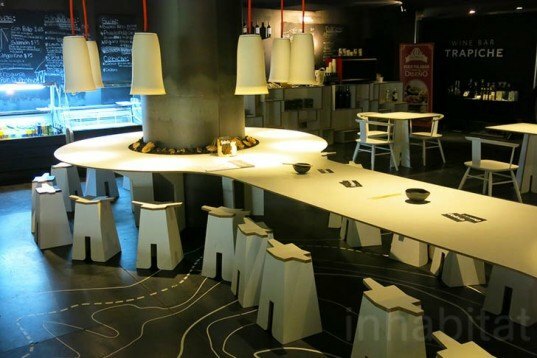 Architect Julio Oropel's Wine Bar Trapiche welcomed visitors with an intimate dark cafeteria decorated with growing mushrooms and MDF and melamine furniture that has antimicrobial certification. Looking out from the Wine Bar, José Luis Zacarías Otiñano's Pensalis Pop... Jardín Aéreo exposed geometrical sculptures from mimbre with bright fishing buoys among 800 baby palm trees. 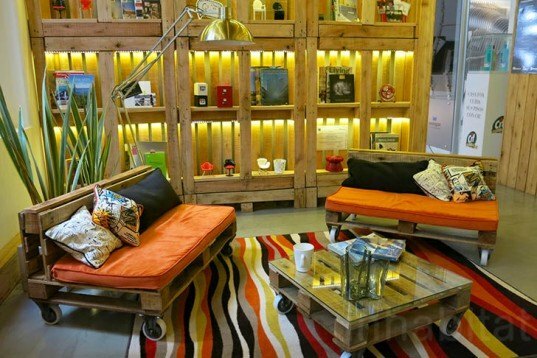 Within CASA FOA's 43,000 square feet decorated area, a space by Grupo 7 was created from repurposed pallets and lighted by rows of LED lights. Architects Maria Zunino and Geraldine Grillo's delicious bakery space La Boulangerie featured old bread tools, plenty of natural materials and a gorgeous standard copper pipes' exhibitor incorporating the old bank's safety box on their design. 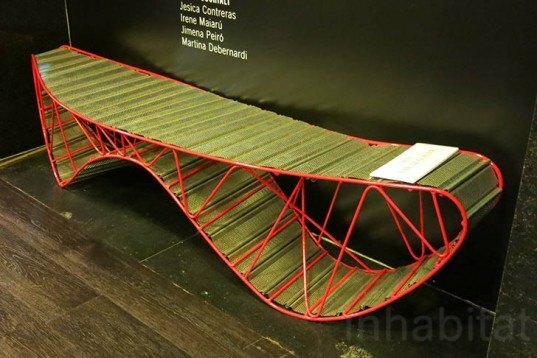 Cristina Le Mehauté created outdoors furniture from shopping trolleys for her Consumo Cuidado? (Responsible Consumption) balcony area. Industrial designers Patricio Barry and Cristian Izuneta's curvy Banco Rubén was designed for public spaces from a steel structure and a strong metal curtain. 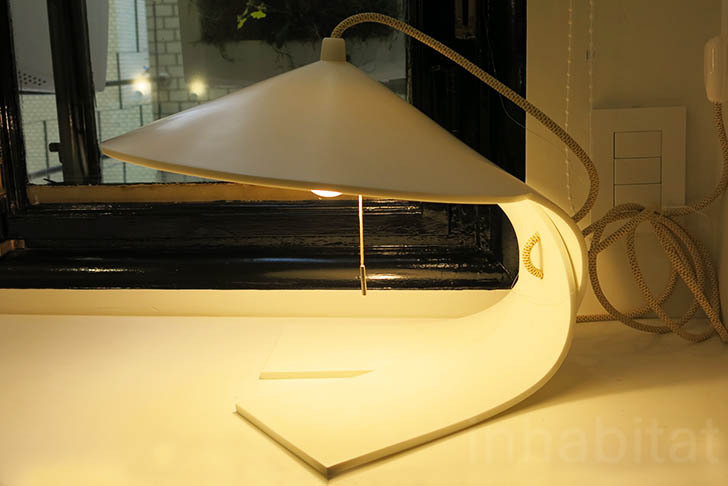 WepLight unveiled a gorgeous collection of flat pack hanging lights made from flexible wood veneer that gives off a soft warm shine. 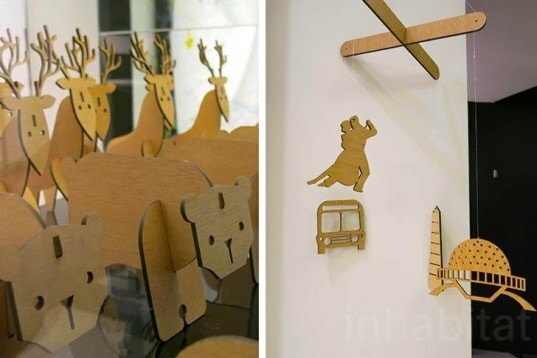 The sweet wooden toys and mobiles by Fabrikken were also on show at this year´s CASA FOA mixing a clean Nordic aesthetic with local icons like Tango and the fantastic Buenos Aires´ Planetarium. Agustin Albarracin´s designs wonders from local fast growing Tacuara cane including this curvy Banco Verde II (Green Bench) for people to share and take rest. And last but not least is a delightful feminine space by Ernestina Anchorena and Carola Pirovano decorated as a blooming winter garden for enjoying nature and reading poems.